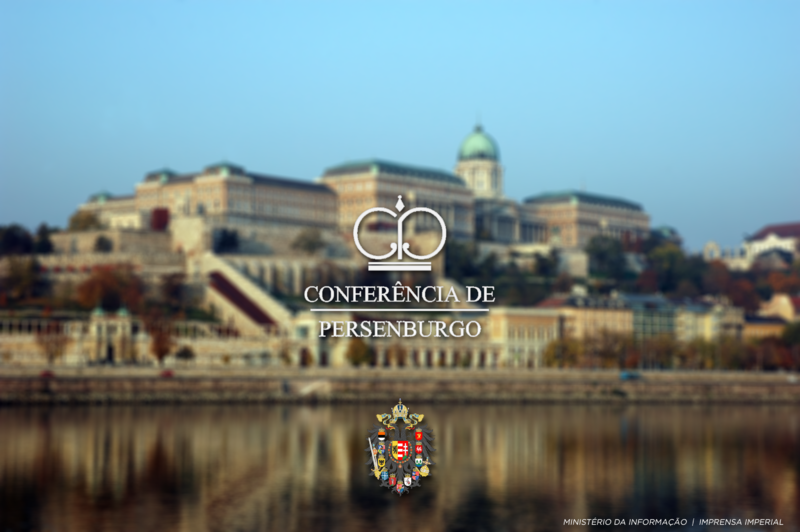 Conference of Persenburg gathers micronational leaders. The Conference of Persenburg was held in frequent, scheduled sessions from 16 to 18 January 2019. The conference was held via Internet, in a Facebook discussion group to overcome obstacles of time and distance. The Conference aimed to discuss economy within the Lusophone sector of micronationalism, studying cases and exposing several topics of discussion, exploring the examples in process among the invited micronations. On 14 January, the first theme of the day was “Micronational Economy: Feasibility”. Representatives of Deltaria, Manso, Villa Alicia and Karnia-Ruthenia participated in the discussion. There was an intense exchange of experiences, especially on the creation of companies in the micronational sector, with emphasis on the Manseans advances. The second debate was “Economic Framework: Practical and Legal Aspects”. Representatives of Deltaria, Manso, Villa Alicia and Karnia-Ruthenia participated in the discussion. This discussion was marked by the exchange of experiences of the representatives, with special attention to the economic practice between the involved ones and the diminutive legislation on the subject in Deltaria. On 15 January, the first theme of the day was “Utilization and Ballast: of the Applications and the Value of the Micronational Currency”. Representatives of Deltaria, Manso and Karnia-Ruthenia participated in the discussion. Innovative measures were discussed to replace ballast, which in practice was less widespread in the micronational medium as a practical concept and foreign micronations and their established ballasts were mentioned. The second debate was “Cryptocurrencies and the Mining Process for Micronationalism”. Representatives of Deltaria, Manso and Karnia-Ruthenia participated in the discussion. It was shown that few micronations made use of cryptocurrencies, as an expensive alternative and with few successful examples in the middle, although it was definitely an option. On 16 January, the first theme of the day was “On the standards of ballast and conversion: economic integration tool?”. Representatives of Manso and Karnia-Ruthenia participated in the discussion. The Mansean conversion alternative was presented; an innovative method with analysis by means of algorithms that would measure activity as a means to convert this variable as value of a micronational currency. Posteriorly, the “Betism”, a economic theory developed by Rafael Campos, Ministry of Economy of Deltaria, was also presented. A suggestion of support for the Nazi-fascist cause on the part of a Deltarian citizen who inspired the theory caused a discomfort with the hosts, making it impossible to continue the appreciation of the theory. The second debate was “National Banks and Reserves and their relevance in micronational government.”. Representatives of Deltaria, Mauricia, Villa Alicia and Karnia-Ruthenia participated in the discussion. The delegations demonstrated a special peculiarity in this topic, each one having developed very particular methods, mostly refined, with special attention to the procedures adopted by Villa Alicia and Mauricia, the most complex. The third debate was “Stock Exchange: national or sectoral?”. Representatives of Deltaria, Mauricia and Karnia-Ruthenia participated in the discussion. Partial interest in the establishment of a national stock exchange was shown to the detriment of one for the whole sector due to the lack of micronational activity and the unpopularity that legislation and regulation on the subject used to cause. On 17 January, for the last day of debates, the first theme of the day was “Economic integration: paths in Lusophone sector”. Representatives of Deltaria, Villa Alicia and Karnia-Ruthenia participated in the discussion. It was found that despite many possible plans, the creation of an entity or body that professed common economic interests would be desirable and would be an instrument to promote economic integration. The second debate was “Economic activity as an incentive mechanism to the activity”. Representatives of Manso, the Reich, Mauricia and Karnia-Ruthenia participated in the discussion. The highlight was the Maurensian activity, which merges mercantile elements into government activity, forcing the public machine to “pay for activity”, in a system unique to micronationalism in any linguistic sector, there being no parallel case and constituting this in pride of the Lusophone sector. On 18 January, the last day of the event, the day was reserved for discussions on the development of partnerships and closure of the event, with the distribution of a commemorative medal to celebrate the first organized economic event in the Empire.